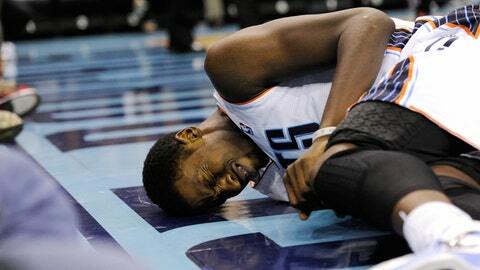 The painful week for NBA players and their hands continues. Charlotte guard Michael Kidd-Gilchrist fractured his left hand in a loss to Dallas and coach Steve Clifford isn’t sure when the second-year player will be back. Kidd-Gilchrist said he didn’t know he was injured Tuesday night until he looked down and his left ring finger ”was messed up.” He was replaced with 4:35 remaining in the third quarter of the Mavericks’ 89-82 win over the Bobcats. Clifford called the loss of Kidd-Gilchrist ”a big hit.” The coach said he might have a timetable on Wednesday for Kidd-Gilchrist’s return. The 6-foot-7 Kidd-Gilchrist is averaging 9.3 points and 5.4 rebounds per game. • Clippers starter and sharpshooter J.J. Redick broke a bone and tore a ligament in his right hand Friday night during a game vs. the Sacramento Kings and will miss 6-8 weeks. • Also on Friday, the Nets’ Paul Pierce suffered a fracture in his right hand against Houston and will miss 2-4 weeks. • On Sunday, the New Orleans Pelicans lost standout center Anthony Davis to a fractured left hand in a victory over the New York Knicks that the team says will cost him 4-6 weeks.